This fraud prevention module will screen every order transacted on Shopify e-commerce platform in real-time for payment fraud. Its sophisticated validation algorithm will accurately detect the fraud patterns to help you to minimize the chargeback and fraud losses. Please visit the FraudLabs Pro Features page to learn more about the type of fraud validation performed and how it could help you to prevent the payment fraud. Login to the Shopify admin area. Go to FraudLabs Pro page at Shopify App Store. Click on the Get button. 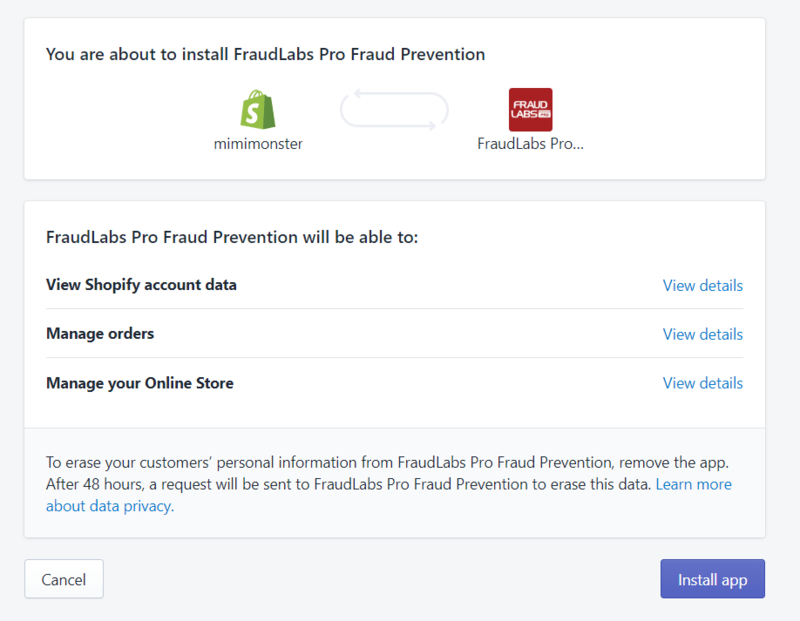 Click on the Install FraudLabs Pro Fraud Prevention button to start the installation. Please take note that this module did not capture sales coming from Shopify POS for fraud validation, but only the sales order from Shopify online store. This Fraud Prevention Module supports SMS Verification Add-On that help merchants to authenticate the client's identity by sending them a SMS for verification. Please follow this tutorial for the configuration. How FraudLabs Pro Status Affects the Shopify Order Status? What to do next after the Shopify App installation? Will FraudLabs Pro screens Shopify POS order?